The London Coliseum (also known as the Coliseum Theatre) is a theatre in St. Martin's Lane, Westminster, built as one of London's largest and most luxurious "family" variety theatres. Opened on 24 December 1904 as the London Coliseum Theatre of Varieties, it was designed by the theatrical architect Frank Matcham for the impresario Oswald Stoll. Their ambition was to build the largest and finest music hall, described as the "people's palace of entertainment" of its age. The London Coliseum was built by the theatrical architect Frank Matcham who intended it to be one of London's largest and most luxurious "family" variety theatres. Construction began in 1903 and the venue opened on 24 December the following year as the London Coliseum Theatre of Varieties. It is located in St. Martin's Lane, London. The Coliseum reverted to the original name when the Sadler's Wells Opera Company moved there in 1968 and, in 1974, the Company changed its name to become the English National Opera; it bought the freehold of the building for £12.8 million in 1992. The Coliseum hosted both the 2004 and 2006 Royal Variety Performances and is also the London base for performances by English National Ballet, which perform regular seasons throughout the year when not on tour. The Who performed there and recorded their concert, on 14th December, 1969. However, after a lacklustre period of poorly received musicals came to an end, in June 1961 the theatre was leased by MGM for use as a cinema during the period that the Empire, Leicester Square was closed for rebuilding. The initial presentation, from 6 June, was a revival of Gone With the Wind which ran for 3 months. On 2 November the World Premiere of Bachelor in Paradise took place in the presence of the film's star, Bob Hope, and following this, on 15 November, was the UK premiere of Samuel Bronston's epic King of Kings. MGM continued to use the theatre even after the new Empire, Leicester Square reopened in December 1962, but MGM's lease expired on 19 May 1963 and the theatre was then leased by the Cinerama Corporation to become the second of London's Cinerama locations (after the Casino Cinerama). Conversion to three-strip projection which used three projectors was undertaken, and an 80ft wide, 30ft tall deeply curved screen was installed. Beginning on 16 July 1963, the theatre was renamed the Coliseum Cinerama, with the UK premiere of The Wonderful World of the Brothers Grimm. This film transferred to the third of London's Cinerama houses, the Royalty Theatre on 27 November and the Coliseum was converted for single-projector Cinerama using 70mm film for the Gala UK Premiere of It's a Mad, Mad, Mad, Mad, World on 2 December 1963. Other 70mm films followed, The Magnificent Showman (the UK Title of Circus World), The Great Race (a 35mm "blow up") and The Bible. With fewer films made in the format, it later became difficult to programme the theatre. It resorted to revivals of old 70mm movies before opening The Comedians on January 18 1968 (a 70mm Panavision blow up). This ran for nine weeks and was followed by a revival of the 1956 Todd-AO epic Around the World in 80 Days, the first time this film had been shown in 70mm in London. This ran until 22 May 1968 when Cinerama pulled out and the theatre reverted to live use. In 1968 the theatre reopened as the London Coliseum, when it also became the home of Sadler’s Wells Opera with a new pit created to accommodate a large opera orchestra. In 1974 Sadler’s Wells became English National Opera, reflecting the company’s position in the heart of national culture. As well as being the home of opera sung in English, dance also continued to play an important part in the life of the London Coliseum – a fact that continues to this day with many national and international dance companies performing at the theatre during the breaks between ENO productions. The company bought the freehold of the building for £12.8 million in 1992. The theatre underwent a complete and detailed restoration from 2000 which was supported by National Heritage Lottery Fund, English Heritage, the National Lottery through Arts Council England, Vernon and Hazel Ellis and a number of generous trust and individual donors to whom they are extremely grateful. The auditorium and other public areas were returned to their original Edwardian decoration and new public spaces were created. An original staircase planned by Frank Matcham was finally put in to his specifications. The theatre re-opened in 2004. 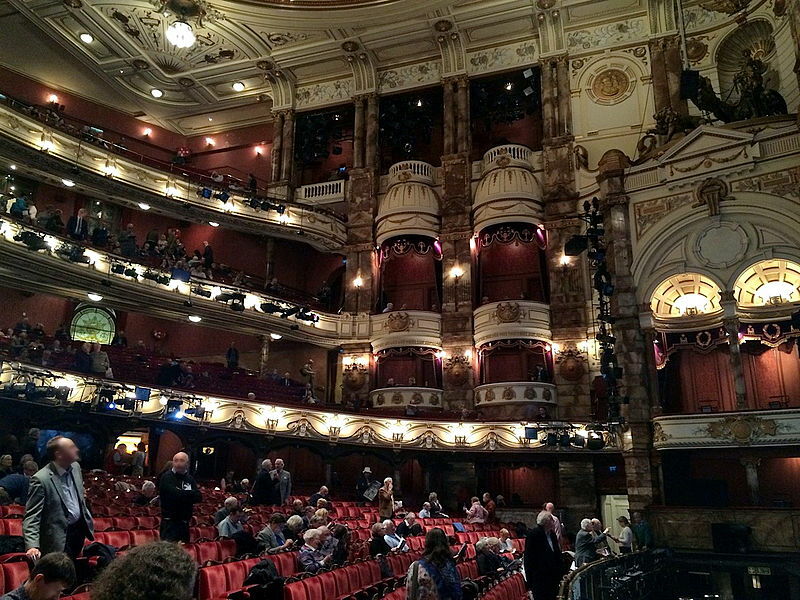 In 2015, ENO announced a plan to open up the London Coliseum with a redevelopment of the front of house spaces, intended to encourage more people in to explore the beautiful interiors of the theatre. Architects Robin Snell and Partners have been appointed to lead the design project, which will focus on the architectural qualities of the Grade II* listed building to reclaim its original Edwardian elegance for a new generation of audiences. 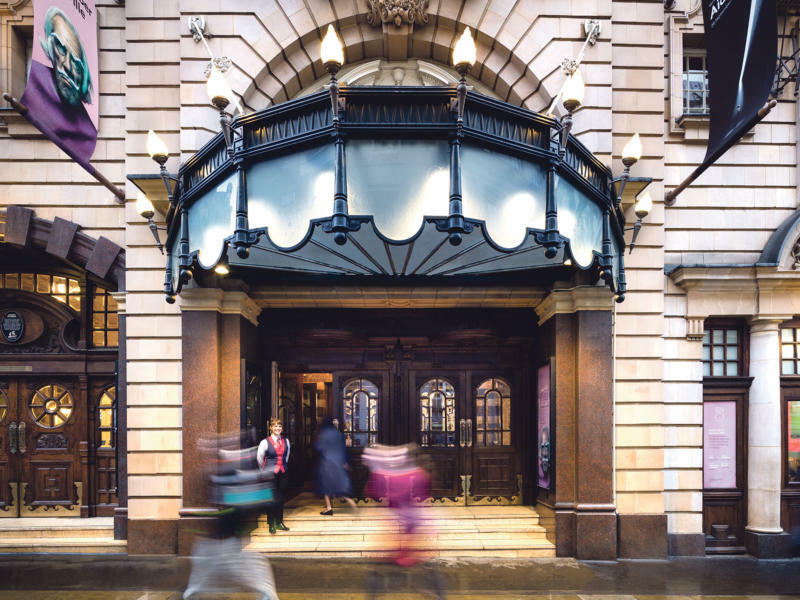 Discover the secrets of London's largest theatre on one of their guided tours. 22 Jan - 01 Jun 2018. The London Coliseum, commissioned by the great theatrical impressario Oswald Stoll and designed by the flamboyant theatre architect Frank Matcham, opened as a Music Hall in 1904. It is considered to be Matcham’s masterpiece and is a sensational example of Edwardian architecture in the grand style. It quickly became known as ‘The Peoples Palace’ – a theatre that was affordable to enter but which would also inspire a sense of wonder and excitement. Their friendly and informal guided tours include a great deal of this extraordinary building, taking in the old Gentleman‘s Baronial Smoking Hall, Stoll’s Balcony, some Private Rooms, the Upper Glassed Terraces, the fabulous auditorium, the warren of staircases backstage, and underneath the vast revolving stage and orchestra pit (when possible). They are sometimes able to arrange private tours upon request. They will try to accommodate your group around any rehearsals that may be taking place. They run an access scheme which gives audiences with a disability or health condition the following: •half price tickets (subject to availability); •priority booking; •CD, Braille and large print version of the ENO season brochure. ◦Download a PDF of the 2017/18 Season What’s On guide; •Braille and large print versions of cast lists and synopses. To join ENO’s access scheme please complete the Registration Form and email it to: access@eno.org. Download the registration form as a PDF. For more information, or if you need assistance completing the registration form, please call 020 7845 9300. Access for people who use a wheelchair or a mobility scooter. They have the following dedicated spaces and provisions for wheelchair users: •two wheelchair spaces in the stalls, two wheelchair spaces in the dress circle and four wheelchair space in the stalls boxes; •transfer seats for those who are able to transfer out of their wheelchairs – four in the dress circle and six in the balcony; •adapted unisex toilets on four out of five levels of the London Coliseum: basement, stalls, dress circle and balcony; •two lifts – including one in the main foyer – which provide access to most levels of the auditorium and to all bars and restaurants. Wheelchair spaces and transfer seats can be booked by access scheme members by calling the box office on 020 7845 9300. For people who are deaf or hard of hearing. Enhanced sound systems. They offer a free enhanced sound system via headphones. To pick up your headphones, visit the information desk in the London Coliseum foyer. Signed performances. ENO offers sign language-interpreted performances where they can. Signed performances in the 2017/18 Season are: •Aida, 9 October 2017; •The Barber of Seville, 18 October 2017; •Iolanthe, 21 February 2018; •La traviata, 28 March 2018; •The Marriage of Figaro, 12 April 2018. For people who are blind or have a visual impairment. Audio introduction. They offer an audio introduction each opera performance which describes the show and begins 15 minutes before curtain up. This audio introduction is available via a headset that is supplied free of charge. To pick up your headset, visit the information desk in the London Coliseum foyer. If you prefer, they can send you this in advance, either by CD in the post, or as an audio link via email. Simply email access@eno.org with your preference. Large print and Braille. The cast list and synopsis for the opera is also available in Braille and large print on the night. Alternatively, they can send you this material in advance in the following formats: Braille, large print, CD or an email containing an audio link. Guide dogs and assistance dogs are welcome inside the auditorium, but they are also very happy to look after guide or assistance dogs during the show – the choice is yours. They provide all dogs with a water bowl, and can take them for walks during the show. Parking. There are a couple of disabled bays in St Martin’s Lane and in Charing Cross Road. However, these do get snapped up very quickly so they don’t recommend that you rely solely on them. Instead, they recommend getting dropped off at the theatre in time for the driver to get to Q-Park Trafalgar on Spring Gardens, which is on the other side of Trafalgar Square. ENO patrons receive a 50% discount at this car park, as well as other nearby car parks. To redeem your discount, please ask the foyer desk at the London Coliseum to validate your car parking ticket and present it to an attendant at your chosen car park. Transport: Charing Cross (National Rail) then 10 minutes. Underground : Leicester Square (Northern Line, Piccadilly Line). London Buses routes : 24, 29, 176 / 6, 9, 11, 13, 15, 23, 87, 91 and 139 and night routes N5, N20, N29, N41, N279 / 6, 23, 139, N9, N15, N11, N13, N21, N26, N44, N47, N87, N89, N91, N155, N343 and N551 stop close by.